Step out of Melbourne with an excursion to The Great Ocean Road in Torquay--about 1h 40 min away. Dedicate the 10th (Thu) to wine at some of the top wineries in the area. And it doesn't end there: admire the natural beauty at Royal Botanic Gardens, examine the collection at Melbourne Museum, get your game on at Zero Latency, and steep yourself in history at Old Melbourne Gaol. Singapore, Singapore to Melbourne is an approximately 10.5-hour flight. You can also do a combination of flight and shuttle. Due to the time zone difference, you'll lose 2 hours traveling from Singapore to Melbourne. Prepare for cooler weather when traveling from Singapore in October: high temperatures in Melbourne hover around 24°C and lows are around 9°C. Finish your sightseeing early on the 12th (Sat) so you can travel to Katoomba. Get out of town with these interesting Katoomba side-trips: Jenolan Caves (in Jenolan Caves), Perry's Lookdown (in Blackheath) and Norman Lindsay Gallery & Museum (in Faulconbridge). And it doesn't end there: admire the sheer force of Wentworth Falls, get great views at The Three Sisters, hike along Fortress Rock, and get outside with Eagle Rock Adventures Pty Ltd.
To find maps, photos, and tourist information, read Katoomba journey planning website . You can do a combination of flight and train from Melbourne to Katoomba in 6 hours. Other options are to drive; or take a train. Traveling from Melbourne in October, you will find days in Katoomba are a bit warmer (30°C), and nights are about the same (12°C). Finish your sightseeing early on the 19th (Sat) so you can drive to Sydney. Sydney is known for nightlife, trails, beaches, parks, and museums. 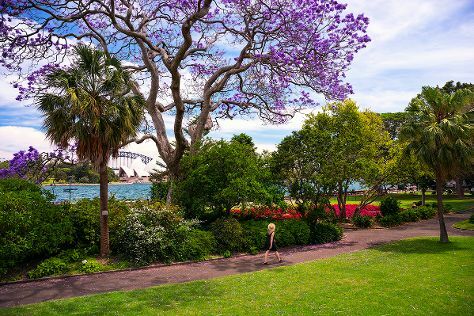 Your plan includes some of its best attractions: admire the natural beauty at Royal Botanic Garden Sydney, stop by Sydney Fish Market, enjoy the sand and surf at Bondi Beach, and catch a live performance at Sydney Opera House. Traveling by car from Katoomba to Sydney takes 1.5 hours. Alternatively, you can take a train. Traveling from Katoomba in October, you can expect nighttime temperatures to be a bit warmer in Sydney, with lows of 17°C. Wrap up your sightseeing on the 26th (Sat) to allow time to travel back home.